On August 11 we carried out an attack on the 39° Bosque and 1° police stations in Santiago. We wanted to show that it is possible to hit the police right in the nose. It ended up as we would have liked as some bastion of law was injured. We love to see wounded or dead cops whether in conflictual clashes or acts of sabotage.They should know that anyone of them could face the same fate as the pigs Moyano, Vera, or Bobadilla; they are all responsible (and volunteers) of belonging to a military institution that represses the population on a daily basis and orders us to comply to the laws imposed by the powerful. It should be clear to them that each aggression that has been committed by the pigs of power is not forgotten, that their condition of impunity will not last long, they are human beings, mortal like any other. Let us dare to confront them, there is every reason to detest the existence of the police, ratis, repressive forces, and/or guardians of the rich. They are the military force of the bourgeoisie in charge of suppressing and punishing every attempt to recuperate that which has been accumulated for centuries thanks to exploitation. Whether in robberies or protests, they are those in charge of exerting fear on the population. Their essence is the defense of the system making us submit to its miseries. They and their bosses should be beaten and attacked with every means and all their manifestations. We remember each blow given and yearn for the multiplication of direct attacks against their repulsive authority, as the preparation of material needed in order to cause the desired damage is minimal. We remember and align ourselves with the compañerxs who carried out the failed attack on January 1, 2014 on the 14° station in ñuñoa, we also would have liked to see how this powerful device detonated and we celebrate the attack on the Lo Prado station!! We send our fraternal greetings to all the families and loved ones of those fallen at the hands of the police. Present in our minds are Matias Catrileo, Jhonny Cariqueo, Claudia Lopez, Daniel Melinao, Javier Mendoza Collio, all are present, dead here or in whichever part of the world they are part of the social war. The trial for the case of “Phoenix” Project has been set for the 4th of June, 2014 and it will take place in the special courtroom, in the female section of Korydallos prison. “Phoenix” Project, started on the 7th of June 2013 and it is a call made from the Conspiracy of Cells of Fire and the Gangs of Conscience FAI/IRF, “Sole-Baleno” Cell, whose target is “the rebirth and the dynamic comeback of urban guerrilla”. A project, that would create the terms of the rise of the Conspiracy of Cells of Fire from the ashes, left behind by police oppression. 7th of June 2013. The car owned by the director of Korydallos prison, Maria Stefi, was blown up by the Conspiracy of Cells of Fire-FAI/IRF and the Gangs of Conscience-FAI/IRF, “Sole-Baleno” Cell. 12th of June 2013. The car owned by the prison guard of Nafplio prison, Argyris Gelbouras, was blown up by the International Conspiracy of Revenge. 26th of June 2013. The third floor of Sheraton hotel was torched by the Anger Unit-International Conspiracy of Revenge. 3rd of July 2013. A parcel bomb was sent to the former chief of the anti-terrorism agency, Dimitris Chorianopoylos by “Mauricio Morales” Cell-FAI/IRF. 24th of August 2013. A police academy was burned to the ground by “Freedom to Mandylas and Tsavdaridis” Cell, International Conspiracy of Revenge-FAI/IRF. 1st September 2013. A parcel-bomb was sent to the special prosecutor Dimitris Mokkas by the Conspiracy of Cells of Fire-“Ryo” Cell. 2nd of October 2013. A sawmill in a hunting resort was torched by ELF/FAI-“Nestor Makhno” Commando. 16th of November 2013. A Letter-bomb was sent to the 98th Electoral Council of La Reina community by the “Long live Ilya Romanov” Cell, in affinity with the Black International. I) 18th of November 2013. An incendiary device was placed outside a church and a bank in San Sebastian area. II) 21st of December 2013. An incendiary-explosive device was placed outside a bank near the airport by the Anti-Civilization Faction of the Earth Liberation Front, in affinity with the Informal Anarchist Federation (FA/FLT/FAI). 9th of January 2014. An ATM was blown up by the “Sebastian O. Seguel” Cell, International Conspiracy of Revenge, FAI. I) 8th of April 2014. A vehicle owned by the municipal regulatory authority and a vehicle owned by a security company were torched. II) 24th of April. An embassy vehicle owned by a Greek diplomat was torched by Autonomous Cell “Christos Kassimis. Hello, we have translated to Czech and brought together some texts about insurrectionary anarchism (the whole brochure of ‘A Conversation between Anarchists’, communiqués and texts about the Roberto Adinolfi case and finally some important texts about FAI). We would be pleased, if you add them to your distro and help us with distribution. Thanks a lot. Trying to be at our best and to continue maintaining the dignity deserved by human lives that rebel against the authority that provokes all kinds of oppression over the face of the earth in which we live, we again go on the offensive in the war declared by the lovers of freedom and their enemies. We remember that in the prisons of the territory dominated by the Argentine State the prisoners who are there continue to be murdered and tortured. And in the streets the misery goes on increasing, the alienation of work and consumption obscures the consciences of the people who constantly go around tensioned by the contradictions of a system that is proclaimed consolidated by a government that speculates with the economic sciences, trying to hide their tyrannical condition at all costs. Sit down, victims, because nothing you have yet suffered compares with the humiliation that all of us feel, we who are threatened with the death and radical confinement which nourishes the theory of those who have the power and will to profit off of the authoritarian methods and practices of civilized society. Our proposal is the direct attack on those responsible for the misery of this reality, now the prison guards are in the sights of all the insurgent compañerxs — or is it necessary to keep saying what points we have in common? Actions say much more than words, but it is also necessary sometimes to mention what the media constantly try to hide. The cars that we burned at 3000 Amenabar street were parked right outside one of the properties of Sergio Berni (secretary of the Ministry of Security), under 24 hour surveillance by the Federal Police. 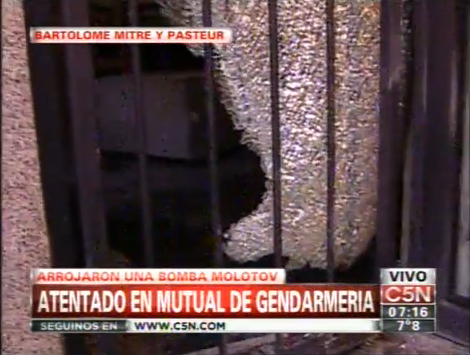 The little bomb we set off in the Prison Guards’ Mutual (Argentine Borders Building), located at 2264 Bartolome Mitre street, on Thursday September 19, 2013 at 1:40 am, unfortunately only caused material damages; we would have liked to find out that a servant of law and order had at least been injured. We salute the compañerxs of the Conspiracy for Revenge and all those who, without lots of questioning, go on the offensive against authority all across the world. 1. Athens, Greece: Letter of anarchist Andreas Tsavdaridis from Koridallos prison. 2. Letter by International Conspiracy of Revenge Indonesian sector Informal Anarchist Federation – International Revolutionary Front. 3. Barcelona, Catalonia: Basic contributions to the discussion about actions and revolutionary struggle. 4. Castelli Romani, Italy: Communiqué on the arrest of comrades Adriano and Gianluca. 5. Buenos Aires, Argentina: Communiqué for the attack on the Academy of Justice. 6. ABC Bristol, UK: Thoughts on the Anarchist Witch Hunt Following Attacks in Bristol. Finally, we had an opportunity to write a letter in a ‘detailed way’ from our own point of view in our group. From beyond the geographical borders, -although it’s never been a limitation for our meetings in ideas and actions-, it is one of the basic problems that prevent our physical meeting,. Through this letter, we want to offer some of our analysis regarding the situation around us (as individuals and as a group), and also our own analysis related to the recent situation of FAI/IRF, since we are part of it. The letter is our critique and contribution for international anarchists of praxis around the globe. The letter itself is the result of our discussion. But one must be aware from the beginning that we are an association of individualists, although we use one name in order of anonymity. In some part of this letter, the view represented the joint agreement among individuals in our group. But we never want to abolish the individual’s judgment. That is why below, you will find some parts where we mention about individual analysis or individual gesture. Since June of this year, we noted that in Indonesia there were at least 4 cases of political shooting against police officers. In our brief analysis, these actions are done by Moslem armed groups. Fundamentalist groups who exist since several years ago. Some individuals said that they started to appear in early 2000 and run until now. Their type of actions most easily recognized by the targets. For example, the bombings of churches and ‘capitalist symbols’ such as hotels or cafés where many foreigners (western or easily-said-to-be white skins) hangout. The most famous actions of this group are the Bali bomb part 1 (12 October 2002), the bomb against JW Marriot hotels (5 August 2003), the bomb action against the Australian embassy in 2004 and three bomb actions known as Bali Bom part 2 (1 October 2005). We highlight one thing, that now the group moved to another tactic. Rather than to send any suicide bombers like before, now they are targeting the pigs (police). As the second part of the Phoenix Project, an explosion destroyed the personal car of a hated prison guard in Argos, Greece. The International Conspiracy for Revenge / FAI have taken responsibility for the direct action as part of their incendiary campaign of revolutionary solidarity. Despite the moves of the repressive authoritarian forces, the new anarchist urban guerrilla develops and conducts new operations, constructing and evolving the black international. Long live anarchy. Destroy all prisons. The full claim in Greek language is here.